Ireland's RTÉ uses Ka-sat IP SNG system, NewsSpotter. Dublin, March 2016: RTÉ, Ireland’s national public service broadcaster, delivered its most comprehensive coverage of the Irish General Election in February, working with Bigblu to use its satellite newsgathering service, NewsSpotter. 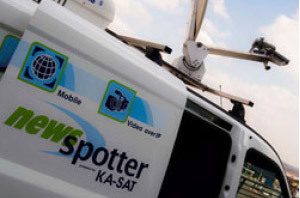 The NewsSpotter service, using the latest generation KA-SAT satellite, transmitted live coverage and interviews from 17 counting stations and political headquarters across Ireland, where there was limited or no access to high-speed terrestrial broadband. The project was an addition to the two-year agreement between RTÉ and Bigblu, announced in June last year, for the public service broadcaster to use Bigblu’s satellite newsgathering service. Bigblu engineers set up the antennas and managed the bandwidth for the broadcasts. Bigblu's broadcast specialist partner, Auriga Kore Networks, controlled the terrestrial routing of the IP signal via London Telehouse North to the RTÉ studio in Dublin. Piotr Kaszynski, Technology Manager, at RTÉ News and Current Affairs said: "The Bigblu NewsSpotter service allowed our teams to cover more counting stations than ever before, in areas where it would have traditionally been more difficult and costly to report from. During the marathon 17 hour TV Election 2016 results coverage we had simultaneous live streams available from 15 different IP KA band Bigblu locations working alongside 17 KU band satellite newsgathering trucks." The NewsSpotter service has transformed the ease and economics of satellite newsgathering. The latest generation of lightweight equipment, with guaranteed bandwidth up to 10 Mbps, supports transmissions of live video and audio in SD and HD. As a completely IP-based service it is adapted for quickly sending store-and-forward files and FTP. It can be used in combination with IP codecs, such as, M-Link Live-X or M-Link News Caster for video and audio.